Flying saucers have been reported on land and in the air. Are they of our making or from outer space? The truth is out there. But what it is depends on who and what you believe. 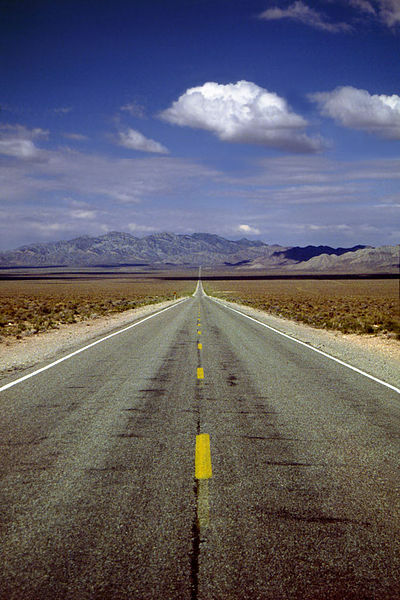 On a lonely stretch of highway about 100 miles north of Las Vegas lies Area 51 – the site connected to the Roswell Incident in early July 1947. Rancher W. W. “Mac” Brazel reported that the wreckage of odd tinfoil-like material was spread over a large area on his property near Corona, New Mexico – about 75 miles from the town of Roswell. A few witnesses also reported seeing strange bodies. “The case for Roswell actually started in 1979, when Jesse Marcel, the Army major who played a role in the recovery of the crash debris, started publicly saying how he thought it was an alien spaceship. Until then, Roswell had totally dropped out of UFO history,” states UFO expert Bruce Maccabee in a Dec. 18, 2009, interview in Popular Mechanics. Off a lonely stretch of highway, Area 51’s function is a mystery to many. But some claim to have seen UFOs and aliens near Roswell. Many believe that a “flying disk” crash-landed here, and alien bodies were removed from the wreckage and are housed at Wright-Patterson Air Force Base. The cast was broken and tosssed into the trash, but Mosgrove retrieved it later and pieced it back together. His conclusion was that it was not human or animal. “At this point, the weight is still toward the unknown, rather than toward the known. … A lot of these people I’ve talked to are very reliable individuals, and there is something going on. I don’t know what. There’s a lot going on at Wright-Pat. I had sources at Wright-Pat that were pretty reliable who really wanted to get to the bottom of it. Even with their clearances, they couldn’t find anything,” Day said. What became of those “remains” and the “UFO?” The government said at the time that there were no bodies and that it actually was a weather balloon. UFO believers say it’s a government cover-up. A couple of weeks before that crash, on June 24, 1947, airplane pilot Kenneth Arnold had a strange experience. “I observed a chain of nine peculiar-looking aircraft flying from north to south at approximately 9,500-foot elevation. … They seemed to hold a definite direction, but rather swerved in and out of the high mountain peaks. 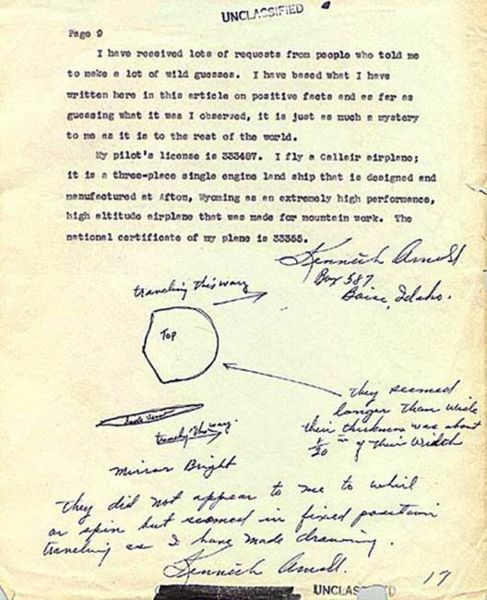 Pilot Kenneth Arnold’s drawing of one of the flying disks that he saw in 1947. Officials found him credible, but thought he was mistaken. There’s no shortage of conspiracy theories. In Part 2: The Dark Side of the Moon (Landing). Our ability to witness, describe, and later recall events is flawed, often to the point of being useless. Even experienced pilots and astronauts can be fooled by the effects of altitude, light, atmosphere, and motion. I find it easier to believe that whatever happened that day in Roswell was related to military activity — these were the very earliest days of the Cold War, after all. When you consider things in that context, government secrecy and evasiveness fit right in. Thank you for all of the additional links and resources, Judy. You put a lot of work into these posts, and it’s appreciated. Glad your appreciate the effort, Charles. As you say, it was the Cold War. The UFOs might have been our own. As a teen, I felt that it’d be very arrogant to think that we were the only life forms in this vast universe. But, I’m not sure about whether we’ve had close encounters. Researching this was a lot of fun. I also am an X-files fan. Love the conspiracy theories and David Duchovny as Fox Mulder. I remember when I was about 10 years old, a family moved a couple of houses down, well I became friends with the daugher there, and we were upstairs rummaging some old magezines and books apparently the previous tenant left, and that box was full of magezines and books on ufos. we have a time of our life reading them, being kids and all it was a magical world. we looked and admired all the photos and stories of aliens, it was alot of fun. Early on, in my radio career, I remember hearing the stories of Betty and Barney Hill who said they were abducted and taken aboard a UFO. Their terror under hypnosis did not appear to be faked. It just fascinated me. I’m not sure what I believe. I just know I haven’t seen one. Thanks for stopping by and commenting, Roberta. Okay, I admit that I was a big fan of the ROSEWELL series, so I really appreciate all the information and resources you’ve shared, Judy. And the first picture is oooOOOooo–really good. Thanks, Marilyn. I did find the information intriguing. My family – now only my brother – lives in Vegas, and I’ve been tempted to take a road trip to Roswell when we’ve visited him. Maybe, next time. Oooh, what a wonderful source for UFO lore, Judy, thank you! I have a lot of reading to do now! Enjoy, Kate. If you’d like more reading on this subject, a friend of mine suggested “UFOs and Government: A Historical Inquiry,” by Michael Swords and Robert Powell. One of my favorite radio shows was “Strange But True.” I was intrigued by those stories. I’m with you, Tita. The unexplained mysteries make us question and wonder ‘what if.” I’d rather have that than boring any day. On the subject of UFOs and related topics, I have one nagging thought or question; “Did God put all those beautiful and magnificent planets and stars in our sky just for our enjoyment, and just to arouse our curiosity? I don’t know, but someday, we’ll find out. I’d love to be around when we finally find out.